Our service manager began as a technician; when he talks about working on your car, he's done the work already and understands exactly what you need. Whether it's a matter of scheduled maintenance or an unexpected repair, let people who love Chrysler, Dodge, Jeep and RAM as much as you do work on your auto. Our motto of Respect, Trust, Enjoy also applies in service and parts; we want you to believe what we say because we say what we mean. Everyone in need of a loaner drives away with one; that's Serpa Chrysler service! 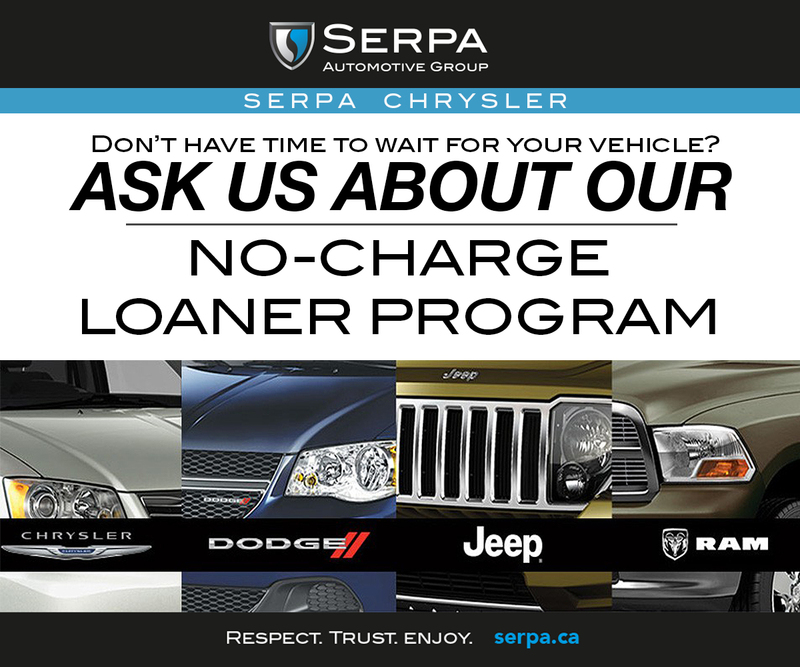 Serpa Chrysler is your number one destination for the servicing of any Chrysler, Dodge, Ram, and Jeep vehicle in the Scarborough, Agincourt and Toronto region. We want to highlight our renewed focus and commitment to show how our #1 priority is customer service. We have a strong and committed staff of service professionals with many years of experience satisfying our customers' needs. Our service team is committed to delivering the very best in service for a full range of vehicles. No matter what make or model vehicle that you drive, we can offer you the same great level of service. Our large facility allows us to provide quick and efficient service to our busy clients. We do everything we can to get you back on the road as soon as possible because we know what it's like. Our goal is to make your experience as convenient as possible to keep the regular servicing of your vehicle from being a chore. We look forward to earning your customer loyalty with our commitment to show how you are our #1 priority at the all new Serpa Chrysler. There are two ways to book your next service appointment with Serpa Chrysler. Once we receive your request, we'll do our best to accommodate your needs right away. No matter what you are looking for, get in touch today and let us worry about the details! Get your oil changed, your battery replaced or your brakes inspected and have it done in no time.